Matt black eyeglass case has Minnie Mouse's Red Bow printed on the top. Measures 6-1/2 inches x 2-1/2 inches x 1-1/2 inches deep. Hard case protects your eyeglasses or sunglasses. Case has hinged back with red flocked interior. Measures 6-1/2 inches x 2-1/2 inches x 1-1/2 inches deep. 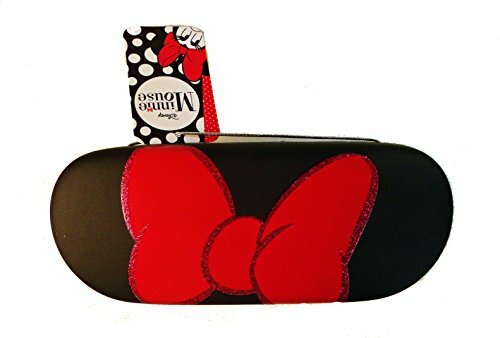 Matt black eyeglass case has Minnie Mouse's Red Bow printed on the top. Measures 6-1/2 inches x 2-1/2 inches x 1-1/2 inches deep. Hard case protects your eyeglasses or sunglasses. Case has hinged back with red flocked interior.